The Star Interceptor line of interceptors has aged well, but as new standards are set and old ones abandoned, it becomes time for newer, more advanced, and most importantly up-to-date fighters to replace the obsolescent vessels of old. When flown to its full potential, it is hard to find anything wrong with the outgoing Star Interceptor B, but I can name one. 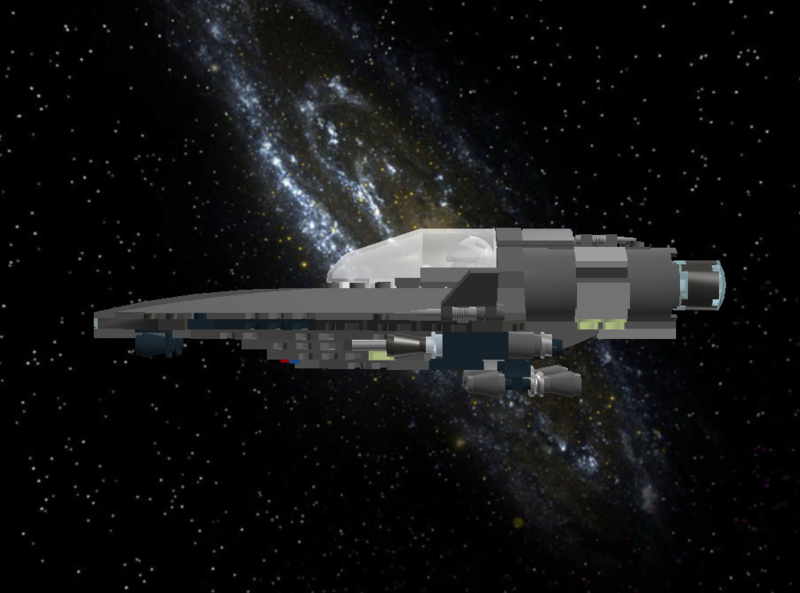 The Star Interceptor B is strong, fast, and even a bit heavy. After all, it has to carry around all those powerful weapons and of course a lot of fuel for its four engines. That there is the Interceptor B's issue. 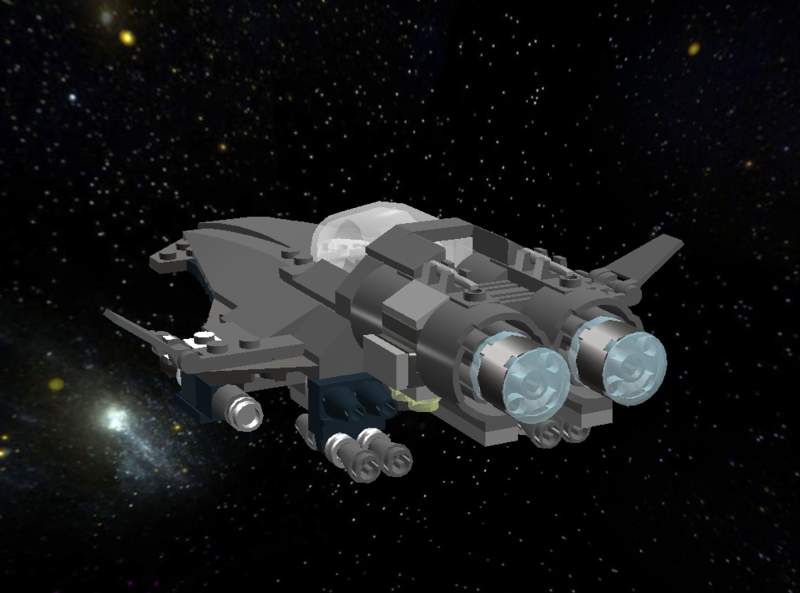 The Interceptor B is still powered by the relatively inefficient engine from the previous generation of Star Force fighters - multiply that by four and the Interceptor is quite the gas guzzler, so in a long chase it will have to turn around and go back home, which isn't an option for a successful interceptor. 1. Refit the Star Interceptor and give it the "new" treatment - ditch two engines, replace the remaining two with fuel efficient engines. 2. We're armed with experience, so proceed to build a new Interceptor. An LXF file can be downloaded from here. Revealed in 2514 is the latest line of fighters to roll out of a United Star Fighters Incorporated factory - the Aerosprite Class Interceptor! 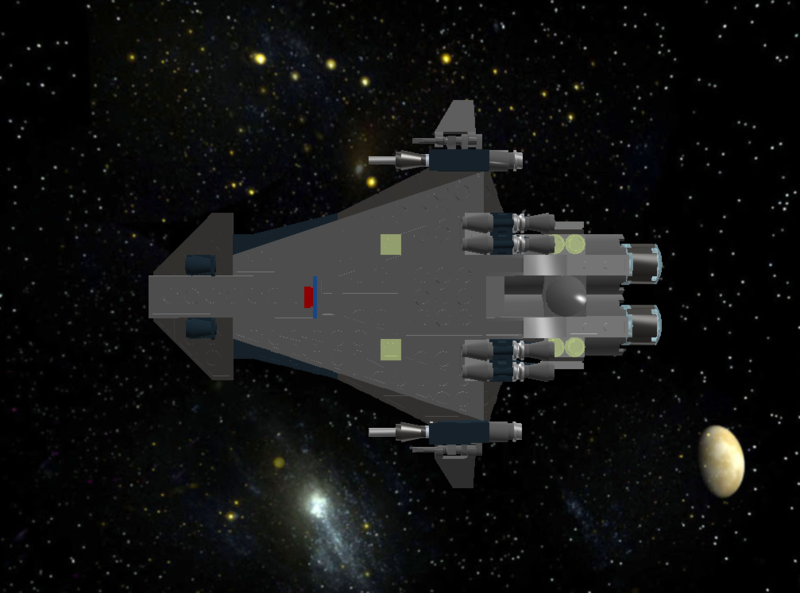 Armed with two wingtip phaser cannons, a torpedo launcher in the nose, and four ventrally mounted rockets, this small fighter has enough firepower to take down a target after a long chase - the latter of which is achievable with the Aerosprite. The twin engines are the latest and greatest, combining fuel efficiency with plenty of twin engine power. The durability of the Aerosprite is assured through shrink-wrap deflector shielding and plenty of armor plating. 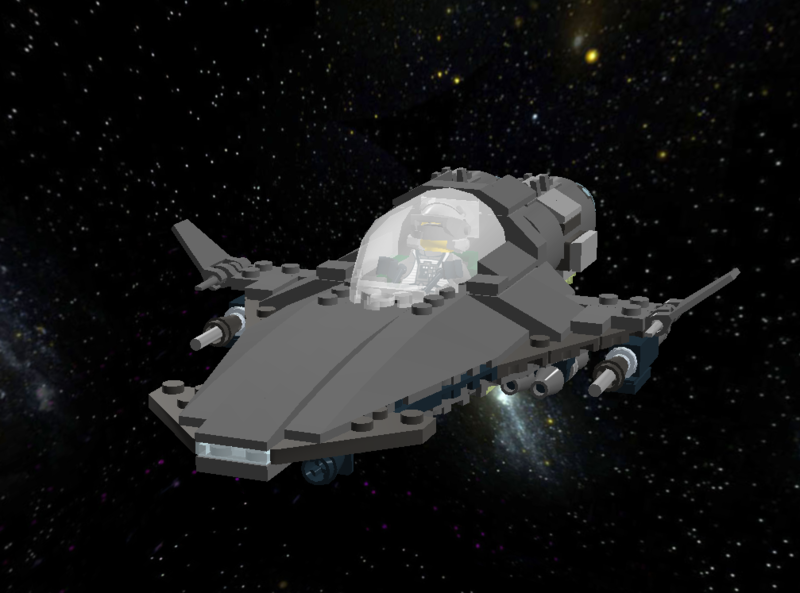 Compared to the Star Interceptor B, the Aerosprite is smaller and lighter. Its design gives it an edge in the handling department - unlike the Star Interceptor B, the Aerosprite is not ridiculously ridiculous to control and its more aerodynamic as well. In a straight line the outgoing fighter beats the Aerosprite due to having double the engines, but not by much due to the weight difference between the fighters. Maintaining the Aerosprite is also much easier than the Star Interceptor B. On the Interceptor B, large blocks of armor covered a lot of panels. On the Aerosprite, thinner but still capable panels of armor do the job instead. The total number of parts on the Aerosprite is also nearly two-thirds less than that of the Star Interceptor B - that's two-thirds less of a risk to finding a broken part, and paying for it. So that's the Aerosprite, small, fast, agile, and resilient. This is, in my mind, one of the best fighters you have yet released. The design gives it an industrial feel, almost. A fighter so small having such large engines convinces me that the Aerosprite is as "fast, agile, and resilient" as you claim it is. Against bombers, this thing could probably take them out before they knew what even hit them. 1. I would change the red and blue pieces to colors that better fit the rest of the ship. It's a little distracting and in combat it just screams to an enemy that "THIS AREA IS IMPORTANT! SHOOT ME!" 2. "Trim the mustache". The little dark gray fins at the front detract from its otherwise sleek and aerodynamic form. I find it crazy that you were able to find a way to make a fighter so small, yet make it minifig-compatible. Hats off to you; I would never have been able to design something like this. As with the Mamba, your feedback is noted and appreciated, Admiral. 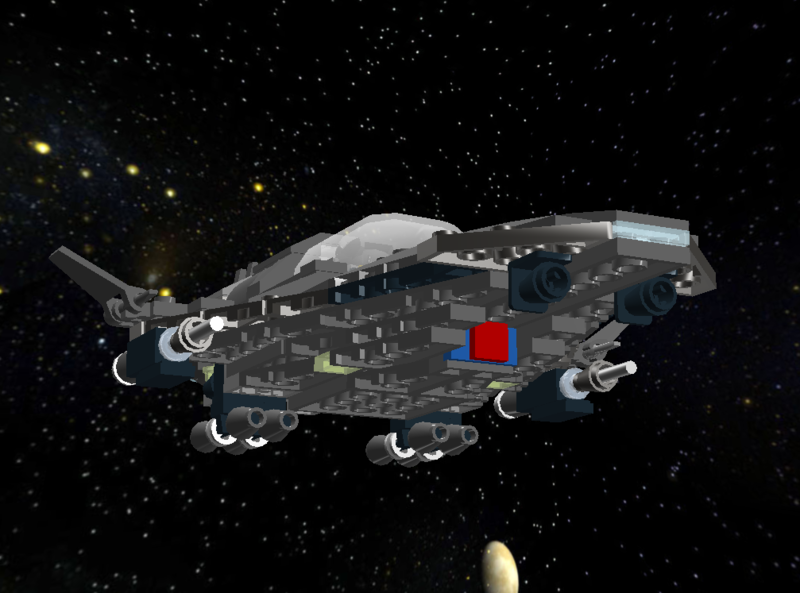 The red and blue part / deflector dish is a bit or something natural to my Federation ships and fighters. We could change the colors, but having the deflector dish (especially in those colors) just makes the fighter look so much more Federation-ish. It's a good idea though. I also built a stripped down unposted version of the Sprite, called the Windsprite, which has a different front section. Basically it is sleeker and lighter with less weapons and less armor, designed purely for speeeeed and little else. Highly impractical but it seemed like something cool. Inversely I also built an unposted Freesprite which has double the weapons and an even bigger mustache. I could post the Windsprite but I don't think the Freesprite has a place here. @kojan: and on the flip side, I find it amazing how you are able to build such large fighters/models while still making them amazingly detailed and flow together very well, and not lapsing into ugly base geometry. 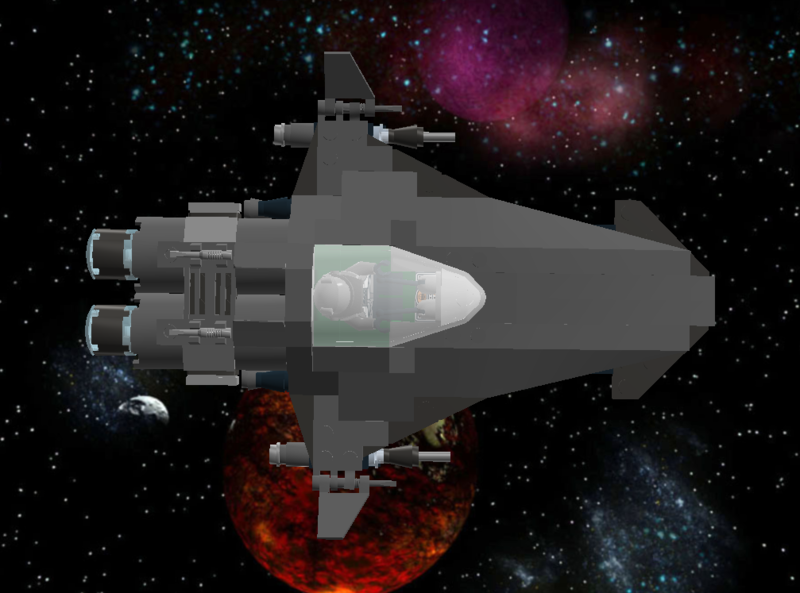 @talmid: This is a nice tiny little fighter. It's also different from your general pattern of fighters, it's always great to see something fresh. You put some good though into the description, and it matches well with the fighter. It reminds me of an A-wing, but about half the size. I love them both - so sleek, and such a change from your usual style while staying completely true to it! But my favorite is the Windsprite; the nose looks like something I would build, stuck onto the rear sections that I love on your fighters. I know I say this almost every time you build a new fighter, but I think this is my new favorite of yours! @Kojan: "Trim the moustache." Lol! It's also the smallest yet, I'm pretty sure.